Basically the same type of tool used to grind coffee beans can be used as a tool to grind dried spices but it is strongly suggested to not use it for both. Using a Spice Grinder only for spices will eliminate the possibility of flavoring coffee beans with unwanted tastes and aromas. By grinding fresh spice, a signficant amount of flavor can be provided for food dishes that is not possible to achieve from dried spices. Some spices have special grinders, such as nutmeg, that are built specifically for the whole spice and the grinding of round shapes. 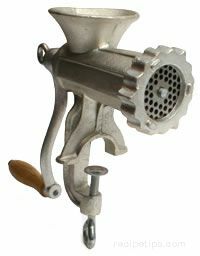 Other tools also work for grinding spices, such as graters which can be used on some types of spices to provide a coarser texture or to mince into smaller pieces. When using electric Spice Griders, be cautious not to grind excessively resulting in too much heat applied to the spice. When selecting a Grinder for spices and particularly the electric machines, make sure the blades can handle the thin or small pieces of spice. Some blades will not be as sharp as necessary or the blades will be positioned too high off the bottom of the grinding chamber so they won't touch or fully grind the spice. In addition, the speed of the blades must be sufficient to quickly grind the spice rather than slowly grinding contents so additional heat is added to the spice which decreases the flavor. Make sure the Grinder can "pulse" grind which means the blades can be started immediately and then stop almost immediately without spinning after being turned off. When cleaning the Spice Grinder, there are a variety of ways to remove debris and powdered contents that remain from grinding tasks. For electric models, first unplug the unit from the electrical connection to make sure it does not become activated while cleaning. Then for either electric or non-electric, empty the grinding chamber of loose contents using a small brush to clean the areas where the spice has been ground. Reconnect the electric units or for manual models simply begin to prepare additional contents that will become "cleansing contents" to be used for grinding. Add a small amount of rice, sugar or coarse ground salt, such as Kosher salt. For some machines, the rice may be too hard and could damage the blades while sugar may have a tendency to add a flavor that remains in the chamber longer than desired. 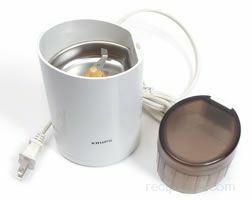 Thus, salt may be the best option to consider when cleaning Spice Grinders.